The Best of Italian Design is a unique event dedicated exclusively to celebrate and display the most prestigious Italian brands and Made in Italy high-end products, addressed to industry professionals. 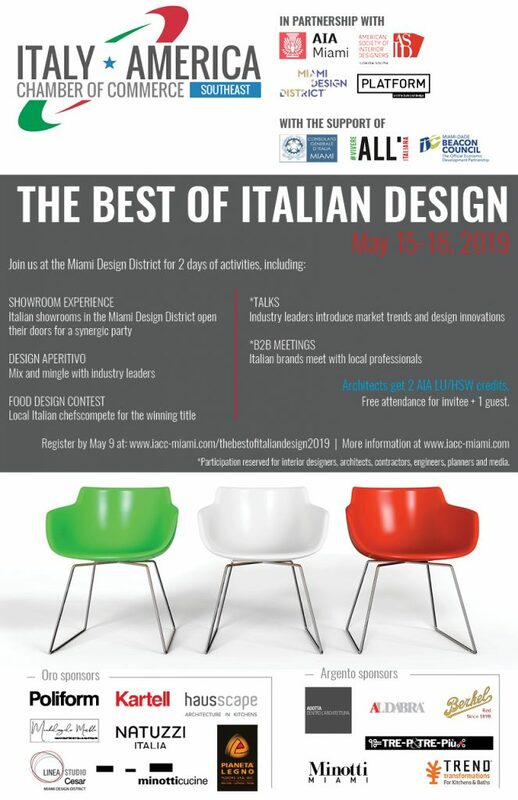 The second edition of THE BEST OF ITALIAN DESIGN takes place at the MIAMI DESIGN DISTRICT, the vibrant and creative hub dedicated to luxury and innovative fashion, design, architecture and dining experiences. The 2-day event is organized in partnership with the American Institute of Architects (AIA), American Society of Interior Designers (ASID), Miami Design District (MDD), Platform Architecture and Design. 7 Italian showrooms located in the Miami Design District open their doors for a synergic party to present their collections. During the night 5 Italian chefs, hosted in different showrooms, compete for the winning title by creating a signature dish with food ingredients and design elements. featuring – among the others – 3 renowned Italian architecture firms and companies CEO. A unique opportunity to learn about the Italian design trends in the world. Innovative Italian design brands meet with local professionals of the industry while enjoying Italian bubbles.